I Was Born To Cook: Presto - pesto! A journal of recipes, stories and more from the kitchen of a 1st generation Italian/Greek girl from New Jersey. Fresh herbs - ahhhh. They smell so good. They look so good. And they die so fast. At least mine do. One of the best ways to use them up before it's too late is to make pesto. Homemade pesto is delicious. Nothing beats it. I try to make enough and freeze it for the colder months, although there usually comes a time when I have to use store bought (Kirkland, Costco's brand, makes a good one). I like this version - it's different from the typical all basil/pignoli nut recipe. It definitely adds a whole new level of flavor. Another thing that I love about pesto is how easy it is to throw over pasta for a quick meal. Frank loves it for that reason - if he's making his own dinner, all he has to do is boil pasta and throw some pesto on top...mix it in...done. It's husband-proof, and we know how valuable that can be! 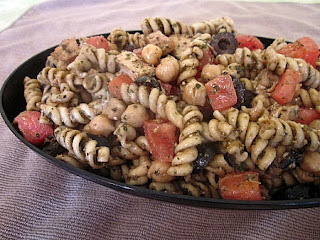 This time around, I made a nice pasta salad with it. A bunch of us were getting together for lunch at my Nana's nursing home, and each made a contribution for all to share. Since I was leaving for a week long shore stint the next day, I threw this together with ingredients I had on hand. Keep this in mind for your Labor Day parties this weekend - it's an easy prep for a big crowd! Pesto works so good in pasta salad! It's one of my favorite ways to eat it. I love this one! You keep commenting, I keep cooking. Simple as that.